1. Will Inflation/Growth Tame the Deficit 2. Will Debt End U.S. Capitalism? 1) US war sales of foodstuffs and arms to the Axis grew the U.S. economy and moved most Axis gold to the U.S. 2) Gold was valued at $35 per ounce and other currencies were a little undervalued in terms of gold. This allowed countries to sell natural resources and the few goods they produced to the large U.S. market at low prices 3) U.S. manufactures didn't mind because England, France, Germany and Japan had lost much of their industrial base and produced little for export. With little world competition U.S. exporters had Oligopoly power. This power allowed U.S. exports to be priced at a relatively high price resulting in high profits for US companies and high salaries for their workers. 4) US loaned dollars to exporting nations which were returned for high quality U.S. manufactured goods and private and public financial assets. 5) Eventually the Marshal Plan added even more dollars into the world currency system which also flowed back to the US. And only the U.S. could print dollars. This was acceptable as long as the US could convert dollars to gold at $35 per ounce. This dollar exchange standard worked for two decade. The value of the convertible dollars became problematic during the 1960's because of these US deficit problems. 1) President Johnson's war on poverty: Job training , Direct Food Assistance and Direct Medical Assistance for about four million poor people. Specificprograms include Head Start, Job Corps, Food stamps, Medicaid, Student Financial Aid. 2) Vietnam War borrowing cost of $500 billion and 3) Countries were unhappy using the U.S. dollar. Why? The US gold reserve of $30 billion were already backing much more in existing dollars and the U.S. government refused to slow US economic activity to protect the dollar by raising taxes. International pressure on the dollar created by inflation caused massive gold outflows. This resulted in the Nixon Shock which severed the dollar link to gold and eventually creating a floating value for gold and a US fiat dollar system. A new negotiated gold value for the was needed. Britain continued to prop up the pound against a market that clearly wished it to be lower. 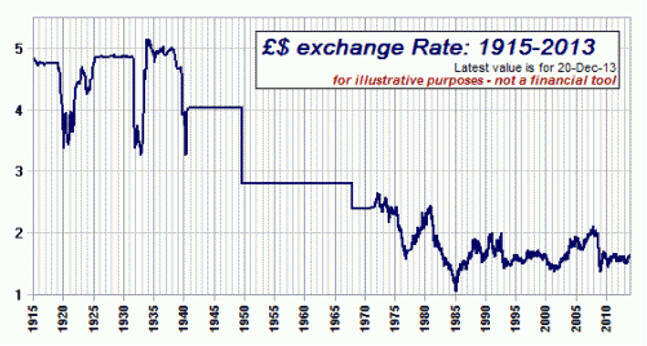 The currency simply did not warrant the value that Britain wished it to have, yet successive Chancellors* refused to allow it to float freely, fearing a sterling collapse. In 1976, the Chancellor of the Exchequer called in the IMF to help arrest persistent runs on sterling. On the advice of the IMF, the Chancellor imposed austerity measures, which reduced inflation and improved economic performance. The IMF’s loan was never fully drawn. The pound recovered – but only temporarily. Against a background of rising unemployment, the famous “Winter of Discontent” in 1978 sounded the death knell for the Labor government. In 1979, the Conservatives under Margaret Thatcher won the election. Many feel U.S. debt would cause the US dollar to have the same fate. To cushion the shock on U.S. exporters, a 10% surtax on all imports was instituted. Japan soon increased the Yen's value against the dollar by 7% meaning the US dollar price of Japanese goods had increased by 17%. Others would be forced to follow. Eventually individual countries negotiated an increase of the dollar value of their currencies by 3% to 8% depending on their US negotiation power. The dollar price of gold was also increased by 9%. So US imports became more expensive by 12% to 17% and import prices decreased by the same amount. In 1973 the value of the weaker dollar was set at $42 and then allowed to float with other currencies. This meant Bretton Woods finally collapsed. Nixon was happy because printing dollars to pay for stuff was now allowed. No gold needed. Nixon also abolished the International Monetary Fund’s international capital constraints that had allowed Arab oil producers to recycle their petrodollars into New York banks. The global ‘Petrodollar’ was born and would grow as countries with their own currency still needed dollars to buy oil. This massive invasion of petro dollars into the US Banking System would end up in a world economy that really didn't need them. Deep-Do-Do would result. Looking for reasons to be worried? U.S. companies are warning that currency fluctuations are weighing on their results, raising a red flag for investors heading into the thick of the second-quarter earnings season, Akane Otani reports. A weaker dollar benefits U.S. multinationals by making exports cheaper to foreign buyers and also making their overseas profits look bigger when translated back into the U.S. currency. But strong economic growth, stable inflation and the Fed's plan to gradually raise short-term interest rates is boosting the greenback. The WSJ Dollar Index, which gauges the U.S. currency against a basket of 16 others, rose to 88.63 Tuesday, its highest level in more than a year. British scholar of international relations Susan Strange believes US international Monetary Hegemony rests on the pillars of production, security, information/ideas, and finance. Professor of International Politics Daniel W. Drezner feels the US does not have to worry about these pillars failing, especial finance, but rather that internal political uncertainty will force external pressures to combine and bring down the U.S. dollar hegemony.
" How Tax Reform Will Net the U.S. Big Returns"
In 1971, Nixon suspended convertibility of the dollar to gold, effectively ending the Bretton Woods system. 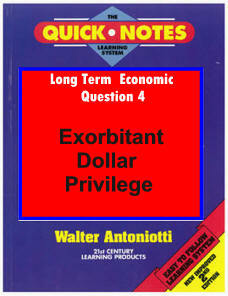 But even after this, Dollar Privilege Continued. Tyranny of the US Dollar? Loss of U.S. economic dominance has been aided by Trump's lowering our place as Leader of the Free World. This when the U.S. dollar continues its dominate role as does American Exceptionalism. The European Central Bank the dollar makes up two-thirds of both international debt and global reserves. Oil and gold have long been priced in dollars. Iran, North Korea, and Russia and other developing are terror stricken by the loss of dollar needed to finance the global payments system. The dollar hegemony may be weakening. Political leaders are pushing back. Paying for European goods bought from European companies should be in Euros, not dollars. China recently challenged the dollar supremacy with a Yuan-based oil futures contract Russia all but eliminated her US dollar based investments because she perceived wreaking dollar. Pressuring non US companies trading with Tehran. Editor's Note: While most of this by political Trump's posturing and return posturing by our economic adversaries. Foreign leaders posturing began when de Gaulle threw a fit. See Russia, China Rivals or Adversaries?